When deciding on Christmas gifts, I chose mostly 60 Quick Knits. This was of course before Em and I made our resolution. I really enjoy looking at all the lovely patterns in the book. 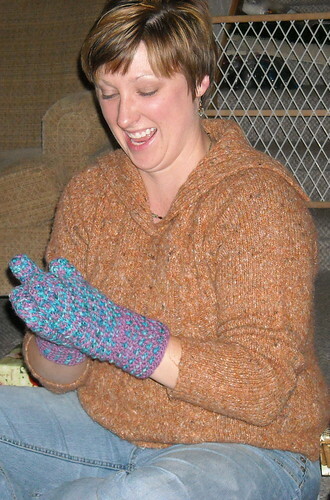 I settled on the tweed mittens and used some yarn I bought from our LYS. The pattern was rather simple and I started knitting them during a rummage sale in the middle of the summer. Of all the mittens I have made these mittens had the nicest thumbs. These mittens were not short like the Checkered Mittens, but instead a nice height. Again I used Cascade 220 to make these. As you can see my sister-in-law enjoyed getting them. They will definitely keep her hands warm this winter and for many winters to come. As always, if you would like to see more pictures check out my Flickr Account. Please let me know if you still need help.